A bit of a different "post" today.. But it will still have some rad polish included, so it works! Last weekend, I was at a salon/boutique here in Saskatoon called Alchemy.. While looking at all the awesome items within the shop, I came across some indie polish called 'Pirate Polish', so of course I was studying the few bottles in stock and ogling the nail wheels.. One of the gals came over and explained that the creator of the polish was local.. like.. here.. in the city. Seriously!? I nabbed a bottle of 'Radioactive' and a card, went home, and went to the etsy shop immediately. While I was paying for my bottle of 'Radioactive', the gal told me that her favourite polish was a gem called 'Borsch'.. 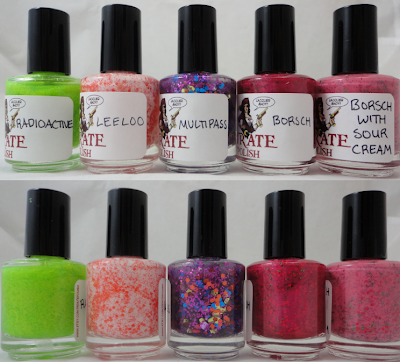 I was sort of sad when I didn't see it up on etsy, so I took to e-mailed Tara (aka the creator of Pirate Polish) to do some inquiring.. a few e-mails later, and I was going to be hooked up with four beautiful bottles of polish. Look at these beauties! I am in some serious like with all of them. 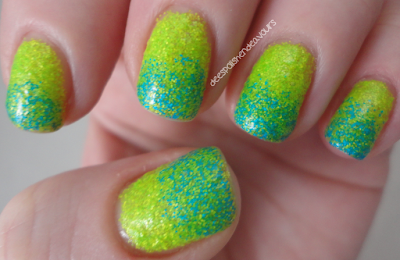 Before I acquired the other gems, I used Radioactive in a slight gradient mani with Floam.. The pictures do not do the super brightness of the polish any justice, but let me tell you: it is in your face bright and lovely! And I'm currently sporting 'Leeloo', because, well, how could I not? I got to meet Tara briefly yesterday when I picked up the polish.. and I honestly cannot wait to do more business with her. I have used two out of my five Pirate Polish now, and I am quite pleased with them. I am super excited to try the other three now!! 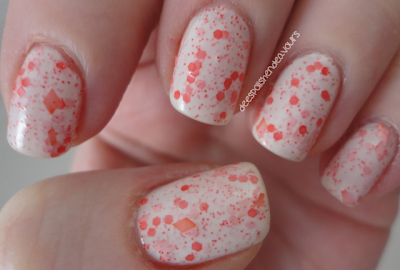 Have you picked up some Pirate Polish yet?? If so, which do you own? I'd like to know so that I can decide on my next purchases!! Yeaaaaah those are a little bit beyond amazing! I especially love the bright neon green radioactive polish. Fun!